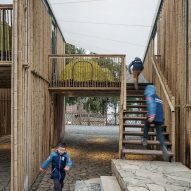 The Architectural Design Institute of South China University of Technology has completed a youth development facility, by renovating a former primary school and adding a series of covered bamboo campsite spaces. 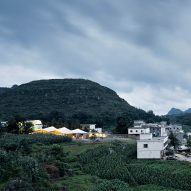 Located in the mountain village of Pingqiao, in southwest Guizhou province, Raleigh Campsite was set up to provide for the local village and employ local craftspeople, but also to provide experience for the organisation's youth members. 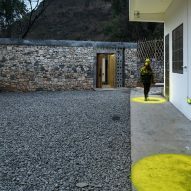 Raleigh International is a non-profit organisation for volunteers in sustainable development. 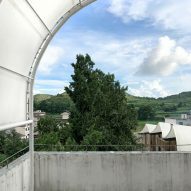 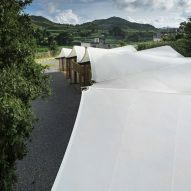 The former three-storey teaching building acts as an anchor for the project, housing storage, the infirmary, and shower and toilet facilities alongside the camping grounds. 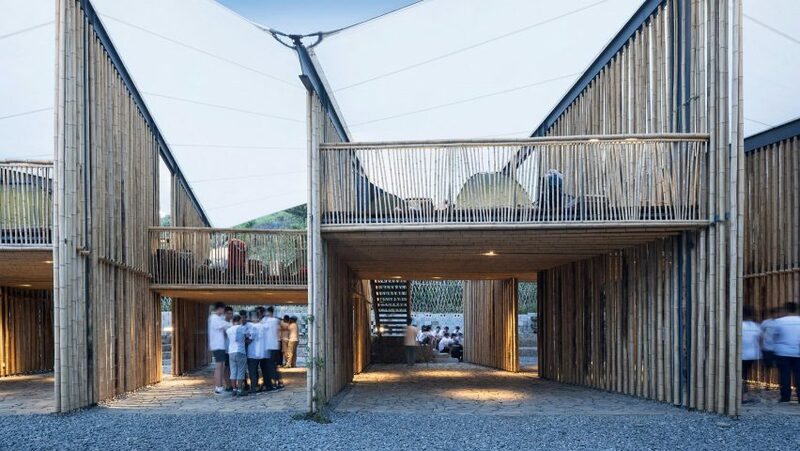 Following the orientation of this structure, the primary new addition is a long, multi-functional lodge space, open to the elements but covered by a tensile fabric roof. 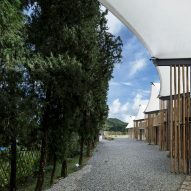 "In moderate yet rainy Guizhou, rainproofing and ventilation are the primary needs of local buildings," said the lead architects from the Architectural Design Institute of South China University of Technology. 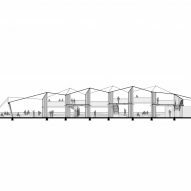 "The multifunctional lodge, the most important space in the campsite, is a continuous space with an undulating membrane roof." 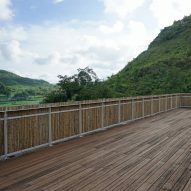 This lodge is roughly divided by sets of bamboo screens, and in certain sections stairs lead up to a higher level overlooking the surrounding mountains. 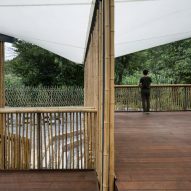 "The bamboo interfaces are almost translucent, people can perceive nearby activities, the natural scenery and experience the open interactive and shared campsite atmosphere," added the design team. 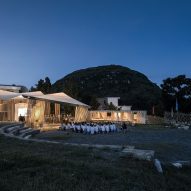 A series of semicircular terraces run along the western end of the lodge, making open-air theatre spaces with stepped stone seating areas. 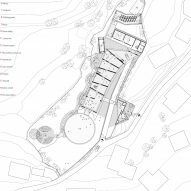 The lodge ends in a large circular assembly area and campfire area for large group gatherings. 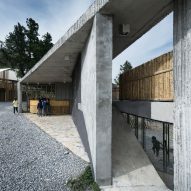 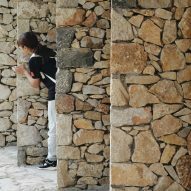 Facing the road, a more robust structure built with stone, concrete and bamboo houses the campsite's reception and a reading room, which doubles as a library for the local village. 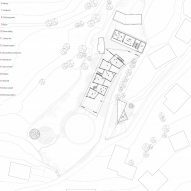 Ground surfaces have all been covered with gravel to aid drainage, and covered areas are paved with local stone slabs, providing a subtle threshold between the lodge and the outside. 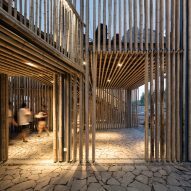 Wood construction has long been used as a versatile building material in warmer parts of the world, but has recently been gaining popularity in colder climates. 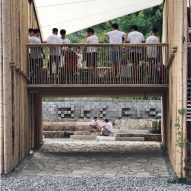 In Vietnam, 1+1>2 Architects used a bamboo framework to support a curving thatched roof for a rural community centre, and in Mexico, Comunal Taller de Arquitectura created social housing units from bamboo that can be built in just one week.